For a refresher on how our NBA Playoff Models work, see this article. For the NBA finals, I added a new model that is built off of playoff data from the prior three rounds only (i.e., playoff games leading up to the finals). This new NBA Finals model has picked the correct series winner 83% of the time since 1990. In addition to this model, we also have our three original models, which are built off of regular season data. Averaging the predictions of these four models gives us the 92% predicted probability of a Warriors victory shown in the bracket below. 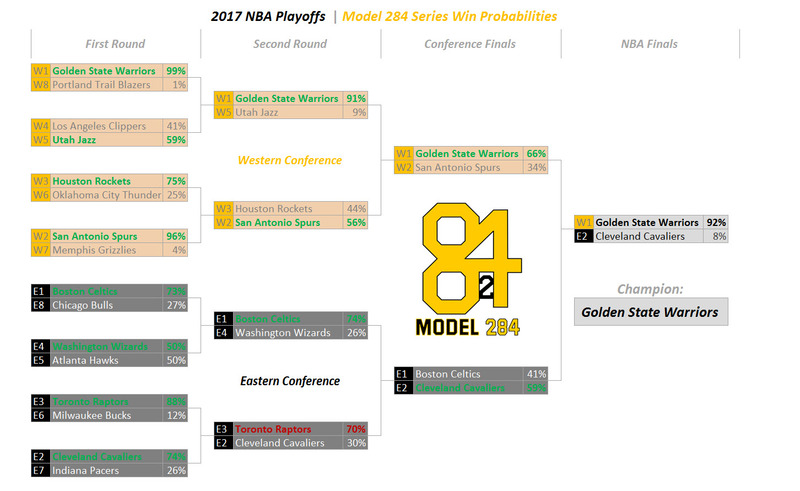 All four of our models sided with the Warriors, but the NBA Finals model gave the Cavaliers a significantly better chance than the other three, with a 22% probability of taking down the Warriors. Our models sided with the Warriors in 2015 and 2016 as well, but gave the Cavaliers a better chance than it gives them this year. In each of the past two years, the Cavaliers performed at a higher level in the regular season, specifically on the defensive end. In the 2015 regular season they posted a defensive rating of 107.13 followed by 105.31 in 2016. In 2017, their defensive rating ballooned to 110.98. We all remember that the Warriors won the series in 2015 and the Cavaliers won in 2016. However, it is important to keep in mind just how close the Warriors were to winning it all in 2016. Had Draymond Green simply shown a little restraint as LeBron James stepped over him, we might be talking about a Warriors three-peat right now. 2017 GSW CLE 91.9% ? ? The third meeting between these two teams promises to be epic. All of our models suggest that the Warriors are the superior team, but the Cavaliers have the best player in the world who is still at the height of his prime. Bring on The Trilogy.